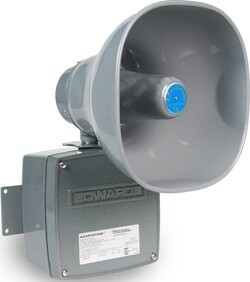 Designed for industrial applications requiring high decibel output and microprocessor reliability. Typical applications include emergency warning systems, plant evacuation and security alarms, process monitoring, shift notification horns, and paging signals. The 5531M is designed for either 1/2" (13mm) conduit or surface mounting. NEMA Type 3R IP 44 UL 464 and 1604 UL Listed for indoor and outdoor applications in Class I, Division 2, Groups, A, B, C & D; Class II, Division 2, Groups F & G; and Class III Hazardous Locations.